The last post was about single phase transformer. The theory is quite easy to understand. 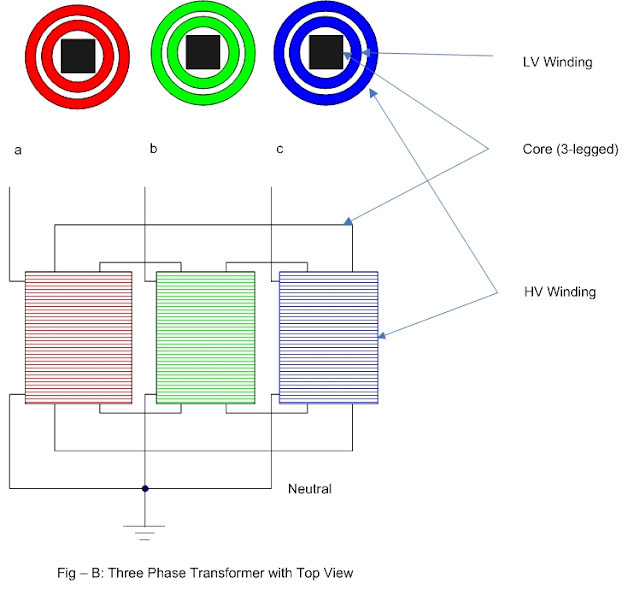 It is time for the three phase transformer. The basic theory remain the same. The three phase transformer can be realized by properly connecting three numbers of single phase transformer or designed as a single unit. The three nos of single phase type requires more materials and costlier where as the single unit three phase transformer requires less materials and so cheaper. When a winding fault occurs in one unit of the three single phase type then only that particular unit is replaced by a similar unit, but a winding fault in three phase single unit type requires replacement of the complete transformer. The three single phase type requires more space. The three single phase type transformer are mainly used for extra high tension bulk power transmission and at generating stations. In this case four single phase transformers are used. Three single phase units are connected to grid and the fourth one is kept ready. Many times this type of arrangement is also done in Hydro power stations or other hilly areas where transportation of large single three phase unit is not convenient or road permit is not available. Where space availability at the switch yard is less, the single unit 3-phase type should be preferred. We have already discussed about single phase type. In the diagram it is shown how three numbers of single phase units can be connected for D-Y arrangement (primary in delta and secondary in star or Y). Three single phase units also called bank of transformers. In the diagram the windings of the same phase are colored same for easy understanding. The Vector(phasor) diagram shown below is also colored. The arrows denote the voltage in a particular winding. The magnitude of red, green and blue arrows are same, denoting the same magnitude of voltage in all the three windings. The directions are 120 degrees apart, means the voltage waves are 120 degrees phase displaced from each other . The direction of arrow for example is BA, which is due to the polarity (dot mark) of winding shown ( you can think that 'A' is positive with respect to 'B'). similarly AC and BC. A balanced three phase system will always form the sides of the equilateral triangle. 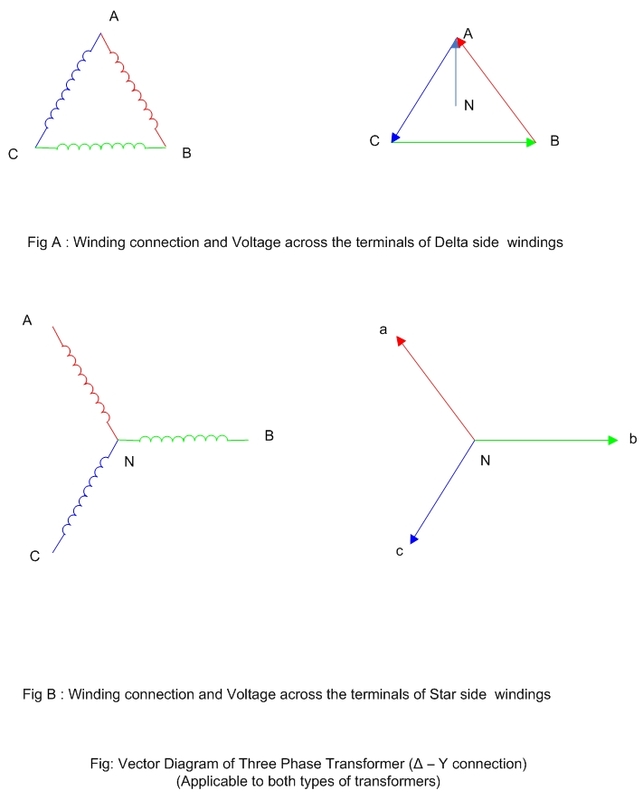 It is simple to remember that as the winding connections form the delta or star so also their respective voltage phasors. 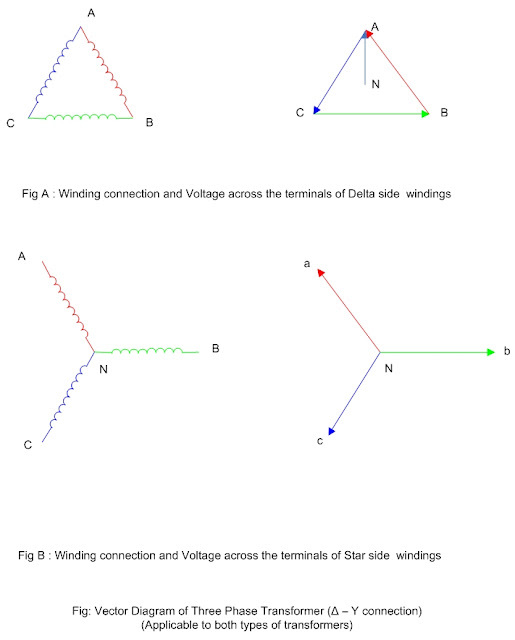 The delta side has a three-phase balanced supply, so also the voltage induced in the windings of the star(Y) side. For example in the delta (primary) side the voltage across the green color winding is CB(from C to B). The basic theory(recall the single phase case) says that the voltage induced in the star (secondary) green color winding is Nb (from N to b). So in the phasor diagram we have shown both green and pointing in the same direction. Similarly it is easy to think about the other windings (color wise). BA has the same direction as Na and AC has the same direction as Nc. The important thing is that CB is the line voltage but Nb is the phase voltage Also BA and and AC are line voltages where as Na and Nc are phase voltages. Using geometry, the line voltage and phase voltage magnitude and phase angle can be calculated. The line voltage magnitude is calculated by multiplying phase voltage with square root of 3. From our phasor diagram it is clear that there is 30 degree phase difference between Na and NA. More accurately voltage phasor Na is 30 degrees ahead of phasor NA. That is why voltage phasor ba is also 30 degrees ahead of phasor BA. In a three phase transformer, the voltage is not only stepped up or stepped down, but also a phase displacement occurs between the primary and secondary sides. There are several other ways of connecting the primary and secondary side windings which is done as per the requirements of customer. The above theory is true for both types of transformers. As both primary and secondary side windings and connection are visible in above type, so we have chosen the above for our analysis. 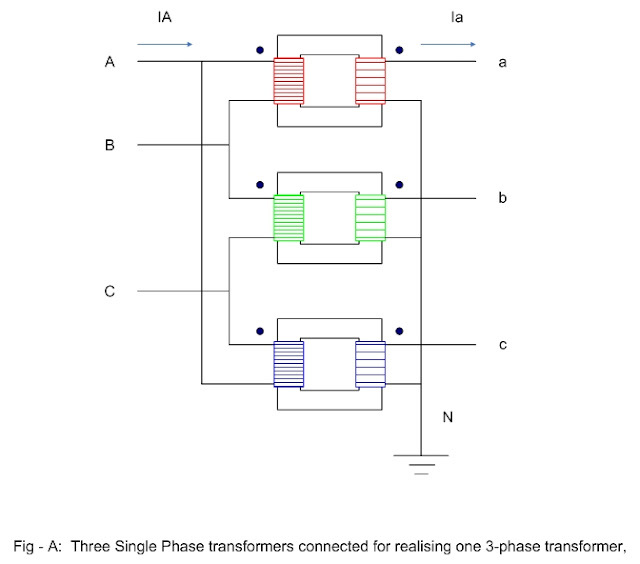 Next we describe in brief the single unit three phase type transformer and also some common transformer considerations. In the diagram below is shown a three phase transformer basic design.The transformer has three limbs. Each phase winding is wound around one of the limbs. Each limb has two windings the primary and secondary windings. On each limb, the low voltage winding is placed nearer to the steel core and the high voltage winding is placed over the low voltage winding. Insulation is placed between the low voltage and high voltage windings. Also the low voltage winding is insulated from the core. The reason of placing the low voltage winding nearer to the core is the requirement of less insulation. See the diagram below. In the diagram 'Top View' it is clearly shown how the primary and secondary windings are wound on the same leg of the core for each phase. To reduce eddy current losses the core of a transformer is made of thin sheets of silicon steel stacked together. The sheets of silicon steels are insulated from each other. The core assembly is put inside the steel tank filled with oil. The oil of the transformer acts as insulator between the winding coils and steel tank. The oil of the transformer also helps in cooling the transformer(more to discuss later). The transformer oil also dampen the noise originating from the core assembly. A balanced electrical system analysis is done in per phase basis. The transformer per phase impedance is very important for this purpose. The manufacturers of transformer provide this per phase impedance along with other transformer parameters and test values. The transformer is designed for achieving a specified impedance value. For distribution transformer the impedance is around 4 ohm and for large power transformer it may be 15 ohm or more as specified by the customer. i also find it interesting! thanks!! if you can state the references, that would be great! Thanks to you for share tips and knowledgeable information about 3 phase transformer. thanks for this post about Transformer, I find it so interesting and I gain a lot of information about it. will you please tell me how it is possible to blow up a transformer's secondary windings which provides 240 volt AC in each phase ? Three-phase supplies have certain properties that make them advantageous and desired in power distribution systems. Power transfer is constant, which helps in reducing generator and motor vibrations. A rotating magnetic field is produced in a specific direction and with constant magnitude which simplifies the design of electric motors. The phase currents tend to cancel one another, summing to zero, making it possible to reduce the size of the neutral as it carries little or no current. The circle formers has mounted two courses as vertical and level, which vertical bobbin had little board space in spite of it has stature than level bobbin and wire end is scattered than even bobbin then its eat Coil Winding up more board room. Level mount bobbins is joined more space however less stature and focal wire end and accessible the heap of multi-range sorts. This is information is very nice.